Anti-Bullying Week is next week! Anti-Bullying week is meant to bring awareness to bullying and teach students ways to combat bullying. 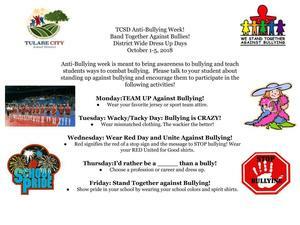 Please talk to your student about standing up against bullying and encourage them to participate in the following activities!